After trekking in the mountains and exploring historical wonders, it’s time to unwind in Madeira. The beautiful island consists of a wide variety of accommodations, all of which are sure to make your vacation much more memorable. So if you’re looking for the ideal hotel or vacation rental, then this list can assist you. These are the top 10 best places to stay in Madeira. This house in Ponta do Pargo is just a five-minute drive from the lighthouse and it can accommodate four people. The ground floor room has a double bed while the second floor consists of two single beds. What makes the property even more amazing is that the bathroom, bedrooms and kitchen are soundproofed, giving you an opportunity to enjoy the tranquil atmosphere with no interruptions. Outside is a garden where you can just sit and appreciate the view of the picturesque surroundings. The friendly host will help you with your laundry and other concerns. The five-star Savoy Saccharum Resort and Spa is situated on Calheta Beach and is only 34 kilometers (21 miles) from the city center of Funchal. Apart from the modern design of the rooms, you will also love the sugarcane artworks made by a renowned local artist. Each room has a flat-screen TV, Wifi, marble bathroom, safe, tea and coffee maker and balcony. The balcony offers majestic views of the mountains and the Atlantic Ocean. 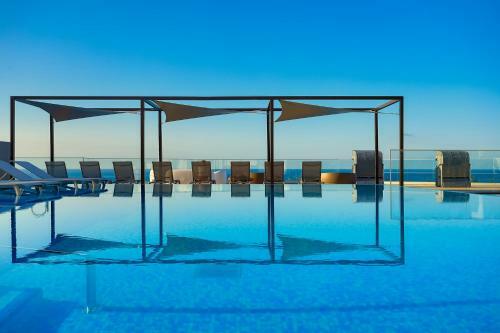 If you check in on a warm day, then head to the rooftop infinity pool for a refreshing swim. The pool area also has a sun terrace where you can just unwind. Other facilities include a squash court, a playroom for kids and two restaurants serving delicious international dishes. This house in Ponta do Sol has a living room with television, fully equipped kitchen, dining area, washing machine, clean bathroom with towels and two spacious bedrooms. There’s also a terrace outside offering magnificent views of the sea. If you want to go sightseeing around the area, don’t hesitate to ask the kind host for a few travel tips. The property is just 5 kilometers (3 miles) from Calheta Beach and 40 kilometers (25 miles) from Madeira Airport. About 1.7 kilometers (1 mile) from Madeira Airport is the famous Santa Cruz Village Hotel. The rooms have a modern look and they all consist of a flat-screen TV with cable channels, private bathroom and balcony. From the balcony, you can marvel at the view of the town and the blue sea. You can also work out in the fitness area or head to the outdoor pool for a refreshing swim. The onsite restaurant will satisfy your appetite with the best European dishes. Other facilities include a bar and a minimart. The property has an authentic Madeiran design and it consists of a well-equipped kitchen, living room with sofa bed, bathroom with the necessary toiletries, television and two cozy bedrooms. There’s a seating area outside where you can unwind while admiring the views. As for the hosts, they will make sure you have your privacy, but don’t hesitate to ask them about the house or the area. The house is located on Prazaeres’ main road and Calheta Beach is just 10 minutes away by car. Quinta Da Penha Franca is in the heart of Funchal and it’s surrounded by beautiful tropical gardens. Each room has a television with cable channels, bathroom with toiletries, minibar, hair dryer and balcony. Some balconies offer views of the lush scenery while the others will show you the Atlantic Ocean. There are two onsite restaurants, both of which serve the best Portuguese and European delicacies. At the pool area, you can go for a swim or just relax on one of the sunbeds and admire the view of the sea. The hotel is just a five-minute walk from the Madeira Congress Center and a 20-minute walk from the beach. It was a hayloft in the past, but now it’s a cottage where you can spend the night. The basalt stone and most of the original features are retained, giving it a truly unique look. Inside, there’s a fireplace, television with cable channels, living room, kitchen with microwave and kettle, clean bathroom and double bedroom. There’s also an area outside where you can sit and just appreciate the lush surroundings. The property is 16 kilometers (10 miles) away from the airport and 14 kilometers (9 miles) away from Funchal. Casas do Pomar in Santana has seven air-conditioned rooms, all of which have a kitchen with a microwave and refrigerator, bathroom with complete toiletries, phone, cable television and private patio. You can just relax or head to the game room to play pool or darts. There’s also a lush garden outside where you can enjoy the views. The villa is 20 kilometers (12 miles) from Madeira Airport and 6 kilometers (4 miles) from Madeira Levada Walks. Hotel Albatroz Madeira’s spacious rooms consist of a flat-screen TV, bathroom with essential toiletries and balcony with views of the sea and the nearby islands. You will also love the nautical decorations and intricately painted tiles. If you’re in the mood to swim, then there are three pools for you to choose from. What makes the pools extra special is that they offer fascinating views of the Santa Cruz Bay. You can also play on the tennis court or have a bite of delicious local and Mediterranean dishes at the onsite restaurant. By car, you can reach Hotel Albatroz Madeira from the airport in only five minutes while Funchal is just 20 minutes away. The rooms of Belmond Reid’s Palace are stylishly furnished and they all have a television with free movies, minibar with complimentary beverages, marble bathroom and balcony. The balcony is sure to astound you with its views of the ocean and tropical gardens. If you want to go swimming, then dip your body into one of the three outdoor pools. The spa offers different types of treatments and you can choose from an indoor or outdoor session. You can also play a game at the tennis court or work out at the fully-equipped gym. As for the onsite restaurants, they offer the finest dishes from Portugal, Italy and many other countries. Praia Formosa Beach is situated on a cliff and it’s a 15-minute walk from the city center of Funchal. Madeira has a mild climate all year round, making it an ideal destination to visit anytime. Now that you know the best accommodations, you can officially start fulfilling your fantasy vacation. Choose a hotel or homestay, pack your bags and let Madeira give you nothing but memorable moments.